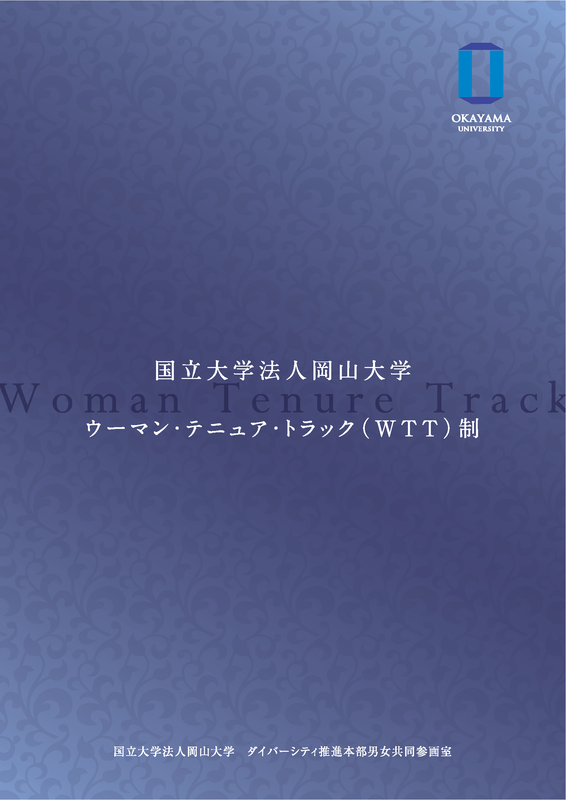 About WTT System｜Woman Tenure Track (WTT) System｜Support for Researchers｜ORGANIZATION FOR DIVERSITY MANAGEMENT, OKAYAMA UNIV. We aim to achieve world-class research in the academic field and position ourselves as a global research base. In order to realize this, the development of the diversity research environment is positioned as one of the most important tasks. 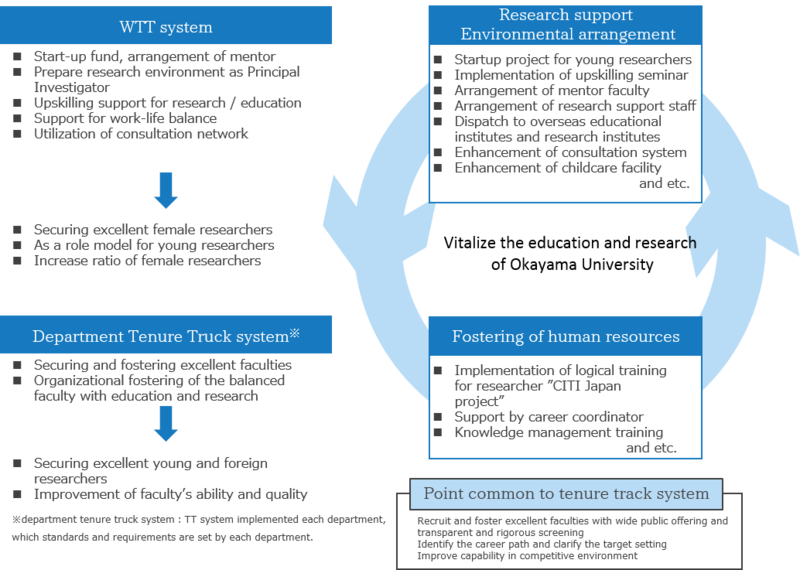 In the 2009 school year, we established the “Woman Tenure Truck (WTT) System” to promote recruitment and foster excellence in female faculties. Following the adoption of MEXT Subsidy for Human Resource Development for Science and Technology’s “Tenure Truck Dissemination / Establishment Project” from 2011, we are improving and developing our system further. What is the WTT system? 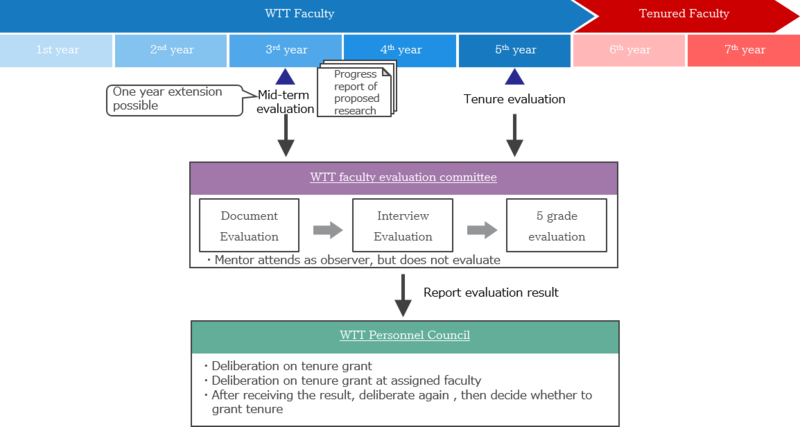 Personnel system that recruits those who are evaluated to have reached the criteria of tenured faculty (unlimited term position or reappointable term position (except reappointable term is limited) which is stipulated Okayama University rules and regulations) after working as an independent researcher at the accepted department. To provide female researchers with independence and performance opportunities in a competitive environment, and supporting the balance between research and family life. We promote recruitment and training of excellent female researchers, which leads to better education and research in our university as a whole. 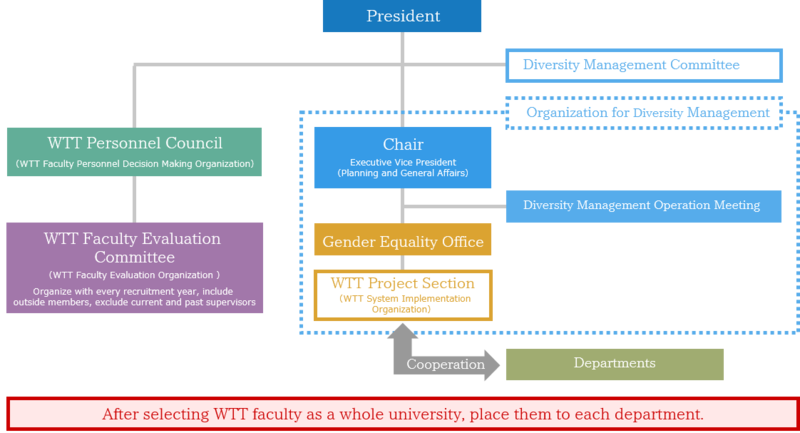 WTT faculty selection is conducted at the WTT personnel council (personnel decision making organization), the WTT faculty evaluation committee* (evaluation organization), and the preliminary faculty selection committee at the assigned department. WTT operation division in the Gender Equality Office will handle from recruitment to review to decision. *Excludes current and past supervisors of WTT faculty candidates and faculty members who have the possibility of becoming a mentor in WTT faculty evaluation committee. There are mid-term evaluation in the third year from adoption and tenure evaluation in the fifth year, then candidates who have reached the tenured standard are offered a tenured position. In addition, if the candidate meets the tenure qualification at the mid-term evaluation, the mid-term evaluation could be regarded as tenure preliminary evaluation and the candidate may be granted tenure ahead of schedule. We conduct strict screening in our hiring process. Without distinguish candidates between from our own institution and other institutions, we conduct objective and transparent evaluation to secure excellent personnel. (C) 2016 Organition for Diversity, Okayama University.